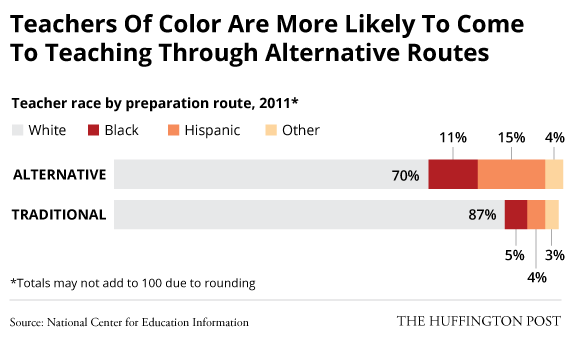 A majority of the public school students heading back to school this September aren't white. But the teachers leading their classrooms are still overwhelmingly so. 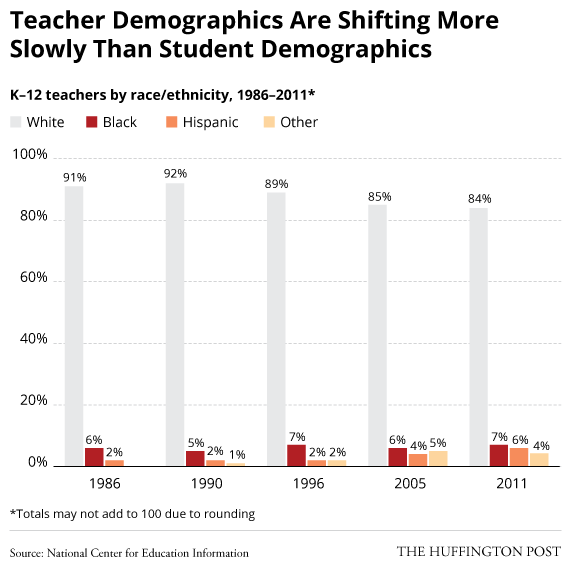 ...but teacher demographics aren't keeping up. 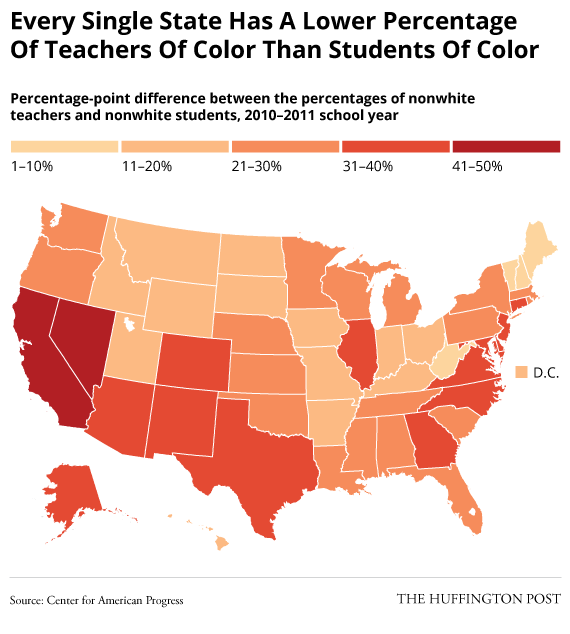 In 2011, 84 percent of public school teachers were white, according to a survey of teachers from the National Center for Education Information. This wasn't much of a change from 25 years before, in 1986, when the survey found that 91 percent of teachers were white. Department of Education numbers reveal a similar trend. In the department's latest School and Staffing Survey -- a nationally representative survey of public school teachers and principals, most recently conducted during the 2011-2012 school year -- 82 percent of teachers reported identifying as white. Nearly a decade before, in the 2003-2004 survey, 83 percent of teachers reported identifying as white. 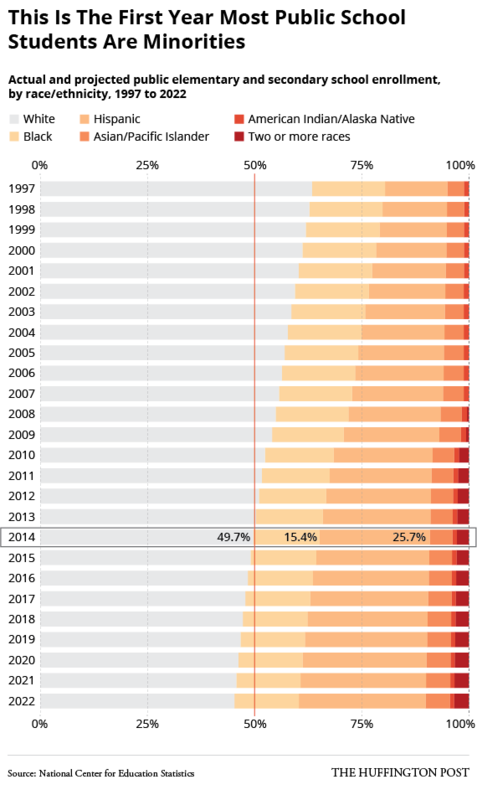 Every state in America has a higher percentage of students of color than teachers of color, according to a "Teacher Diversity Index" included in a 2014 Center for American Progress report. The index uses Department of Education data to pinpoint the percentage-point difference between teachers of color and students of color in each state. "We know that for African-American children or Latino children, it's important to their learning that they have teachers who look like them," said Walsh. "It's a very high priority to alternative providers to be aggressive in getting minorities." "While minorities have entered teaching at higher rates than whites over the past two decades, minority teachers have also left schools at higher rates," Ingersoll and May wrote in a 2011 report. "Overall, the data show that minority teachers' careers have been less stable than those of white teachers, and included more job transitioning. In recent years, minority teachers were more likely to migrate from one school to another or to leave teaching altogether."